Mrs. Pratibha Patil moved into national politics in 1985, as a member of Rajya Sabha and within a short period of time she was elected as Deputy Chairperson, Rajya Sabha on 18th November, 1986. 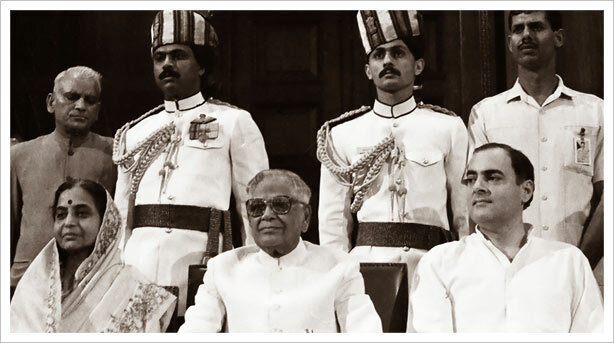 Given the vastness of India’s democratic structure, number of parties, varied ideologies and the prevailing political turmoil, due to the raging Bofors issue, it was expected that some of her rulings would create uproar and they did; but without any heartburn. Most of her rulings were acceptable to all parties; the reason being that her decisions were based on logic, not emotions. They were backed by rules, conventions and precedents. Her mature handling of the Rajya Sabha proceedings was an outcome of her inherent strength and more than two decades of State Legislature experience. In November 1988, she resigned from the Rajya Sabha to come back to the State politics as the President, Maharashtra Pradesh Congress Committee and spearheaded the Congress party campaign for the Lok Sabha elections in Maharashtra. She herself was elected to the Lok Sabha from Amravati constituency and became Chairperson, House Committee, Lok Sabha in 1991. After her initial victory in 1962 elections, Mrs. Pratibha Patil successively and successfully scaled various peaks in the State politics. In 1985, she entered the Rajya Sabha and started participating actively in the proceedings. To many it was remarkable to see her in-depth knowledge on issues ranging from family planning, banking, and co-operative societies to Babri Masjid. She was concerned about the growing population and its impact on the economic growth. She not only propagated methods for controlling population but also voiced her concern about the sensitive issue on many occasions in the Parliament. She also spoke in support of the deprived sections of the society, workers of sick textile mill and need for low budget housing for the under privileged. During her short stint, Mrs. Patil had made such an impression in Rajya Sabha that when the motion for the selection of the Deputy Chairman was moved, she was easily elected as the Deputy Chairman and during the felicitations most of the leaders, cutting across party lines praised her. Dipen Ghosh remarked, “Rajya Sabha is known to get stormy and rowdy but Pratibha Tai with her quiet, soft nature will be able to render peace here whenever the need arises”. Once in chair, Mrs. Patil conducted the proceedings effectively and impartially. She gave her interpretations and rulings on varied topics like amendment to Bills, issues under examination of committees, concurrent subjects, constitutional points, parliamentary etiquettes, privileges and suspension of Question Hour. When the Rajya Sabha became a platform of heated arguments and counter-arguments, she maintained her calm and remained composed. She continued to conduct proceedings with unwavering efficiency. S. Gurupadaswamy, while surmising Mrs Patil’s performance as Deputy Chairman said, “She was not only astute but also charming. There were occasions when the opposition entered into confrontation with her, but all these parliamentary skirmishes ended in good humour”. P. Shiv Shankar said, “Though a diminutive figure, the exterior being soft, her interior had been very strong, she had handled the house in the most tempestuous of times and her handling was so adept that it undoubtedly infused a great confidence in one and all”.